We are developing a technology based on Ion-Release Impedance Spectroscopy (IRIS), a technique that employs liposomes as a biosensor component for detection of small biological entities. This technique relies only on electrical impedance measurements, eliminating the need for incorporating cameras, lasers, and other optical components which often increase the size and cost of a biosensing platform. 1. The analyte of interest is separated from a biological sample by immunoaffinity chromatography or some other purification/isolation method in a microfluidic device. 2. The captured analyte is tagged with a liposome encapsulating ions (such as 10X PBS) which is functionalized on its surface with an antibody or peptide that will specifically bind the analyte. 3. Unbound liposomes and background media are replaced with low-conductivity media, such as deionized water. 4. The microfluidic chamber is heated, which increases the fluidity of the liposome membrane, eventually causing it to release its contents. 5. The change in electrical impedance is measured throughout the process, and a decrease in impedance is observed as a result of the addition of ions into the media. 6. The number of liposomes in the microfluidic chamber can be determined from the impedance change that is measured, and is the basis for quantifying the analyte. Fig. The figure depicts the opposite of the first derivative of the impedance measured over time which the heating step is performed. 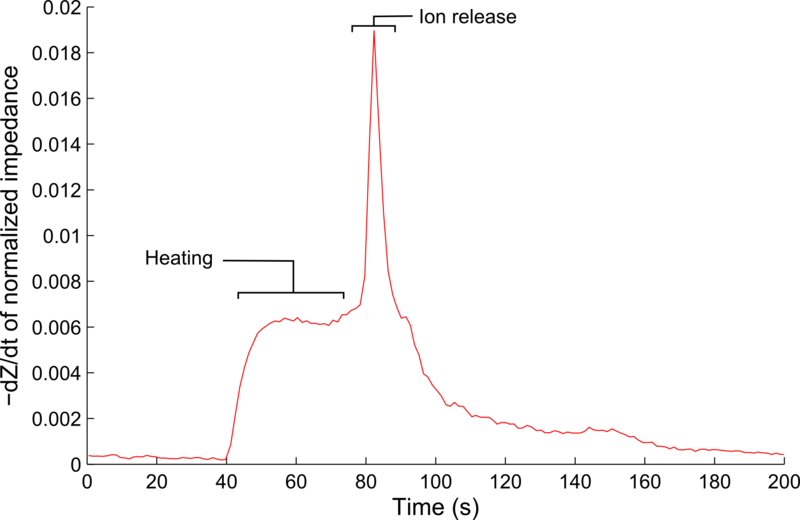 Note the sharp peak in change in impedance which corresponds to the release of ions from liposomes. G. Damhorst, C. Smith, E. Salm, M. Sobieraj, H. Ni, H. Kong, R. Bashir, "A liposome-based ion release impedance sensor for biological detection,". Biomedical Microdevices, 2013. DOI 10.1007/s10544-013-9778-4.